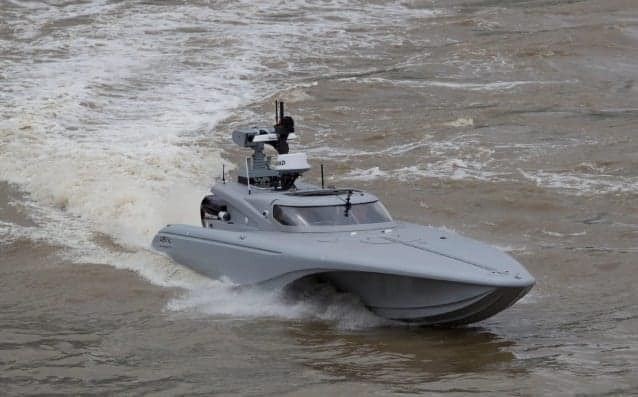 Ship technology companies Sonardyne International Ltd., and Guidance Marine Limited have announced that they are working together on a project that will help unmanned autonomous vessels navigate, even when they lose access to global navigation satellite systems (GNSS). The system uses Sonarydne’s SPRINT-Nav all-in one subsea navigation instrument, which combines Sonardyne’s SPRINT INS solution, Syrinx DVL and a high accuracy pressure sensor, into one tightly integrated unit. The tight integration enables highly accurate acoustic aided positioning by integrating sensor data from the Doppler Velocity Log (DVL) and/or other acoustic positioning inputs. Additionally, it takes in position data provided by Guidance Marine’s vessel-mounted CyScan laser instrument, which takes range and bearing measurements from targets mounted on buildings or stationary surface structures in the ocean, to calculate the vessel’s position and maintain positioning between targets. During initial trials, a CyScan was mounted on Sonardyne’s Echo Explorer survey vessel incorporating additional GeoLock functionality. During a transit, between Sonardyne’s Plymouth Sea Trials and Training Centre and at the company’s classroom facility in nearby Turnchapel, where surface markers were located, the two instruments were used to calculate Echo Explorer’s position. Less than 0.5 metre positional deviation over a 1 kilometre transit was achieved during the trial, when compared with local, shore-based RTK Global Positioning System (GPS) data. Future trials will incorporate water track velocity data, using Sonardyne instruments, to further aid the INS positioning. Guidance Marine will also deploy its recently launched SceneScan product, which maps surface features of structures, such as offshore oil platforms, processes the point cloud data and applies simultaneous localisation and mapping (SLAM) techniques to provide relative position data – further expanding autonomous navigation capability. “By proving and demonstrating these technologies, we will enable autonomous vessels to behave in a safe and predictable manner beyond the point at which existing systems revert to human control. This will include safe, reliable positioning in the event of a sensor failure (such as the denial of GNSS, which is becoming ever-more common), and enhanced positioning to enable moving in challenging and complex environments,“ said Derek Lynch, Sonardyne’s Global Business Manager for Marine Vessel Systems.